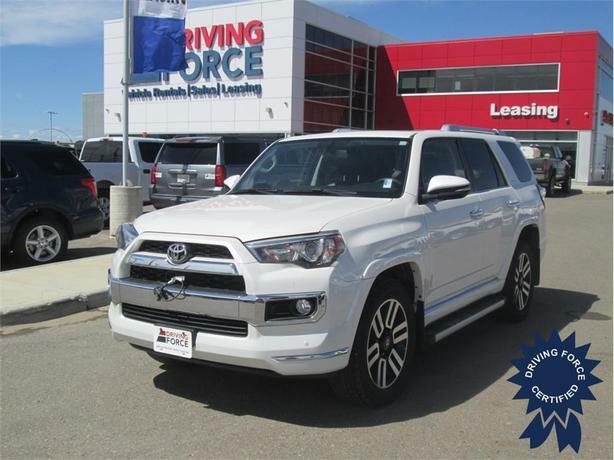 This 2016 Toyota 4Runner SR5 7 Passenger 4X4 SUV has leather seats, 20-inch aluminum alloy wheels, 3.727 axle ratio, Class III towing with harness and hitch, three skid plates, 1,312 lbs Maximum Payload, hydraulic power-assist speed-sensing steering, auto locking hubs, 87-litre fuel tank, X-REAS Sport Suspension, front fog lamps, LED brakelights, running boards, splash guards, five 12V DC power outlets, remote keyless entry, cruise control with steering wheel controls, manual air-conditioning, low tire pressure warning system, backup camera, and rear child safety locks. The 4.0-litre V6 gas engine provides 270 horsepower at 5600 RPM and 278 lb-ft of torque at 4400 RPM. Touch base with us using our handy web form and one of our sales consultants will assist you with any questions you may have.